Your kitchen can fill with clutter faster than you think, making the task of decluttering the room a big endeavor. If you’ve been putting off reorganizing your kitchen because you’re afraid it will turn into a bigger job that you’re prepared for, try getting rid of a few things at a time instead. Breaking a big task like decluttering your kitchen into smaller chunks can make the job a little more manageable. 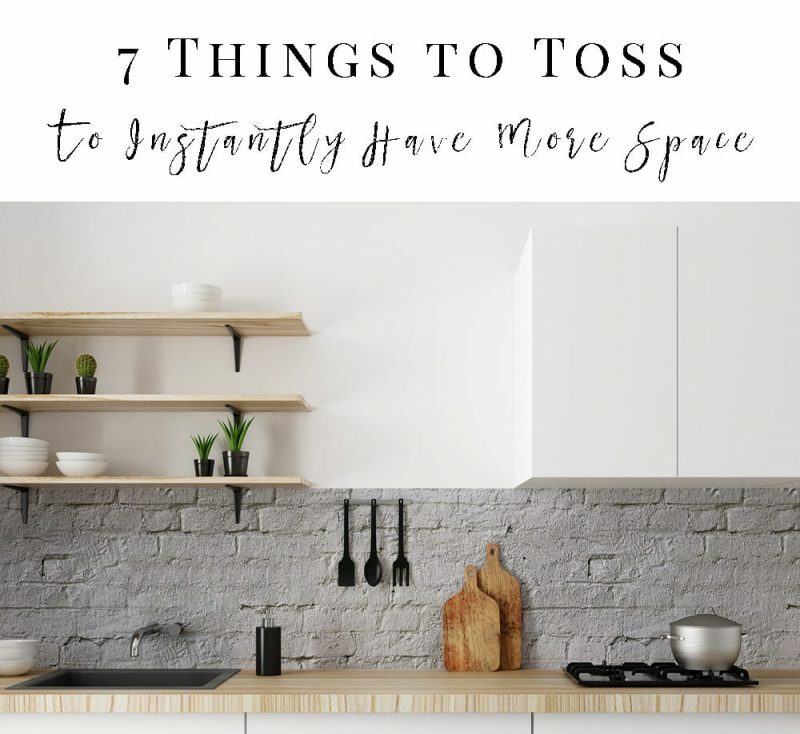 To get started, consider tossing these seven things from your kitchen – you’ll instantly find you have more space! What’s more frustrating that digging through your Tupperware collection trying to find a container and the matching lid? Make your life a little less stressful and clear some space in your cabinets by decluttering your Tupperware collection. Start by getting rid of all the containers that are missing lids and lids missing containers. Then, throw out any of the Tupperware pieces that are stained or cracked. Keep whatever is left. Or toss them all out and opt for a set of storage containers with interlocking lids to save on storage space and ensure you won’t ever lose a lid again. What I did when I last got so fed up with my tupperware and never having lids to match, so I bought two different sets of Pyrex containers. I bought this big set of Pyrex and this small set too. These are microwave, dishwasher, fridge and freezer safe. While having a good set of kitchen utensils on hand is imperative to making a great meal, you don’t need a drawer full of extra utensils wasting space in your cabinets. To have a well-stocked, but not over abundant, utensil drawer keep three spatulas, one can opener, one wine bottle opener or corkscrew, three whisks (if they’re different sizes or materials), a set of salad tongs, and three spoons. You should also keep any other specialty utensils you use often, like a garlic press or lemon zester. But if you don’t use it regularly or haven’t touched it in more than six months, its probably safe to toss. It’s tempting to keep those extra ketchup packets and napkins laying in the bottom of your drive-thru bag, but there’s really no reason to add the extra clutter to your kitchen. In fact, you should scan your refrigerator and cabinets for any additional take-out extras you have stored away. Toss those plastic silverware sets, chopsticks, sweet and sour sauce packets, pizza dipping sauce, soy sauce, and salt and pepper packages. You already have regular-size versions of most of the sauces in your fridge, and I’m sure you have a really nice set of silverware that you use daily. You can even throw away your collection of take-out menus — you can usually find a copy of a restaurant’s menu online, so there’s no reason clutter your kitchen with the additional paper. Is your linen drawer overflowing with dish towels, table clothes and oven mitts? Take stock of all your kitchen linens to determine what to keep and what to toss. Get rid of any towels that are stained, ripped, or have holes in them. Toss oven mitts with burn marks or tears. And throw away all stained placemats, cloth napkins, and tablecloths. Dishes are a necessity in any kitchen, but they can also be the thing that takes up the most space in your cabinets. To declutter your dish collection, start by removing all dishes that are cracked or chipped. You can also get rid of any mismatched dishes in your cabinets, like that silly novelty coffee mug you got from your cousin. Finish by removing dishes you don’t use very often – extra serving platters, large bowls, or dessert plates, for example. You should also think about tossing (or donating) any dishes you received as a gift but never really liked – there’s no sense wasting space in your cabinets with things you don’t even want! Kitchen appliances can cause a ton of clutter in the room, so taking inventory of the appliances you use (and the ones you don’t) can make a huge difference in the organization of your kitchen. Consider donating the appliances you just don’t need anymore, like that George Foreman grill that’s been collecting dust in the back of your cabinet and the pasta maker you bought before cutting back on your carb intake. Not only will you clear your cabinets and make your kitchen more organized, but you’ll also be making easier for you to find and grab the appliances you use all the time. It’s a given that you should throw out food when it expires. That’s easy to do for fruits and vegetables that show their age as they ripen, but I’m sure you have a ton of canned goods, packaged foods, condiments, and even spices, that are well past their prime and you wouldn’t even know it. Declutter your pantry and refrigerator by taking the time to look at the expiration date on the packages you have in your kitchen. Throw away anything that is expired and move the things that are close to their expiration date to the front, so you’ll be reminded to use them before they go bad. 30 Fabulous Recipes with Salted Caramel! Unicorn Hair: Am I Too Old?